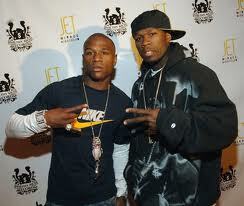 50 Cent and Floyd Mayweather friendship killed by Manny Pacquiao, promotion company destroyed. Floyd Mayweather and 50 Cent’s promotion company TMT is caput and 50 might be running away with Manny Pacquiao. He and his fighters – Yuriorkis Gamboa, Billy Dib and Andre Dirrell – have moved over to a brand new promotions company called SMS Promotions, leaving Mayweather stuck with Oscar de la Hoya as his best friend. It was a friendship that rivalled Joey and Chandler, but now it’s over. Their friendship was touching in a way. At Mayweather fights you’d see the fighter stroll out into the smoke with 50 walking behind him holding his belts proudly in the air. Despite the massive star he is in his own right you could tell he was proud to be part of his boxing friend’s entourage, and I’m sure Mayweather was happy to have someone with bona-fide street cred backing him up. Then there were the 24/7 shows where 50 and Floyd would sit around having a laugh, sometimes taking part in a healthy bit of sports betting and other times cracking each other up by pretending to use a stack of money as a telephone. That’s nothing. I got into fights with friends at school where we’d circle each other for a few minutes, throw a few half-hearted punches and then end things with a headlock on the ground. Floyd and 50’s current spat seems a lot worse and that is mainly due the involvement of Manny Pacquiao. "50 Cent and I have been talking now for maybe the last two months. They approached us with the idea to form a promotional company. Initially it was going to be 50 Cent, Manny and Floyd. But right now I don't think Floyd is going to be a part of it. " Floyd has been quiet on the whole affair to date, not even taking the time to trash talk on Twitter. In fact one his tweets posted yesterday was an advertisement of the TMT Promotions Twitter handle. It seems the sudden split between the two came as much as a shock to Floyd as it did to everyone else. The only question left is will Justin Beiber be carrying all of Floyd’s belts from now on?